A couple of years ago, Anadarko Petroleum workers in East Texas noticed a bald eagle near one of the company’s wells, prompting some investigation that turned up a nest just a few hundred feet from the well pad. They began monitoring the nest and not long after they did, an eaglet appeared. They named the young eagle “America” and continue to look out for the well-being of the family. The episode is just one example of oil and natural gas companies being mindful of animals that make their homes in areas where energy operations are ongoing. Companies often work with other organizations to monitor sensitive populations and create safe environments that allow those populations to thrive. It’s part of industry’s commitment to minimize its impact – on environments, habitats and communities – where it operates. In addition to its eagle conservation effort in Texas, Anadarko has partnered with the U.S. Bureau of Land Management (BLM) and Wyoming Game and Fish Department to monitor the state’s elk population. The arrangement included a $500,000 contribution to fund a study of ways to ensure the elk are protected. Other companies are working proactively to preserve wildlife, too. In Alaska’s North Slope, ExxonMobil is pioneering the use of new technologies to better understand how wildlife, in particular polar bears, move throughout its site. Using infrared cameras, satellite-based remote sensing technology, and ground surveillance radar and drones, the company can monitor animals’ locations and movements. In 2015, the company added the ability to detect when polar bears came within a half-mile of a worksite – critical for the safety of employees, but also to help bears feel comfortable in their own environment. This technology is now being used to monitor other animals that move around this vast site, including caribou. Oil and gas companies working in the Arctic work closely with specialized companies, such as Fair Weather Science, to locate polar bears and their dens via flyovers in planes equipped with infrared cameras. BP has supported research that has led to new methods for locating polar bear dens, which allows the company to map out “no go” buffer zones to ensure polar bears have a safe, secure place to live. BP is also supporting studies for seals, snow geese and other wildlife populations. Efforts such as these are helping to decrease their interactions with polar bears, while simultaneously contributing to increased knowledge of the bears’ habits. The commitment to protecting wildlife extends beyond land and into our rivers, lakes and seas. For nearly 30 years, ConocoPhillips has monitored a North Slope fishery on the Colville River in Alaska. The fishery biologists work with the local Iñupiat in the village of Nuiqsut to monitor the migration of Arctic cisco. The result is valuable information that helps predict future fish populations and contributes to a thriving fishery. In Alaska’s Cook Inlet, Apache Corporation monitors beluga whales and other marine mammals, including orcas, seals and porpoises, in areas where they conduct seismic testing. Similar to polar bear surveys, Apache works with scientists and marine mammal observers to locate and map distribution of marine species exclusion zones. If beluga whales or protected species are sighted, Apache shuts down all seismic operations until the animals have either left the designated area or haven’t been seen in a specific amount of time. Monitoring is just one aspect of wildlife protection. In 2013, Apache Corporation partnered with the Coastal Conservation Association, the state of Louisiana and others to create an artificial reef to replace offshore habitat that was being eliminated through the decommissioning of an offshore rig. The rig served as an important habitat for angler populations, and the removal of the rig created an opportunity to preserve this crucial habitat. Programs such as pollinator gardens are also popular with oil and natural gas companies. Pollinator gardens are specific areas planted with pollinator-friendly plants for bees, butterflies, insects and some mammals, which they can use as food sources and nesting sites. Scientists have cautioned that bee populations are declining in the United States – a significant problem because of the role bees play in agriculture. 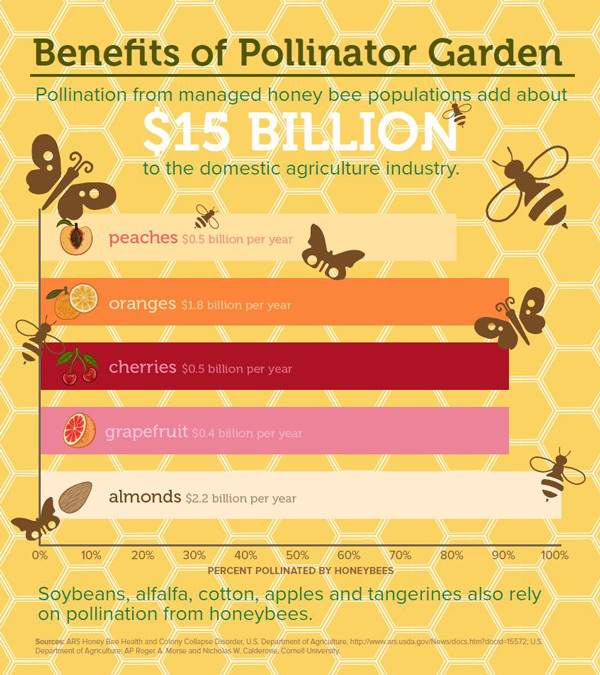 Pollination services from managed honey bee populations add about $15 billion to the domestic agriculture industry alone. Bees also help to pollinate about one-third of the foods we eat, especially fruits and vegetables. ExxonMobil installed a pollinator garden at its Baton Rouge, LA, complex in 2009. Over time, the garden has grown from a 2-acre site to 10 acres and is accompanied by newly planted trees for birds to use as nesting sites. Phillips 66 installed a sanctuary for bees and butterflies at its Technology Center in Bartlesville, OK. To optimize the land for butterflies, the company focused on planting milkvetch, an essential food source and nesting host plant for butterfly populations in the United States. Oil and gas companies also understand the importance of endangered species. Devon Energy, Apache Corporation and Occidental Petroleum Company all work with local officials to help protect the dunes sagebrush lizard and lesser prairie chicken in New Mexico. Devon worked with the U.S. Fish and Wildlife Service and BLM to study the sagebrush lizard and helped determine that it did not need to be classified as endangered because of the size of its population. In addition, both Devon and Occidental work to minimize impacts on the lizard’s habitat and restores areas where it has finished operations to create a safe space for the lizard to thrive. Apache also worked with other companies to establish and implement best practices for companies operating near the lizard’s habitat. Devon and Occidental also joined 30 other companies in five western states to create conservation areas for the lesser prairie chicken. In March 2014, it was estimated that these companies committed to enroll 4 million acres and provide $21 million in conservation efforts over a three-year period. By summer 2014, 156 companies, including 110 oil and gas companies increased acreage to about 7 million with funds for conservation efforts totaling $43 million. These companies have worked hard to protect and create habitats for the bird as well as provide regular reports to BLM to ensure the safety of the lesser prairie chicken. The unique bird’s population and health have been boosted, and it was removed from the Endangered Species List this summer. With the creation of safe, protected environments for local wildlife, it is important to learn from these animals. Companies across the industry are opening their sites to local students. In Pennsylvania, Anadarko created a “Classroom to Conservation” program with Loyalsock Township High School. As part of the program, Anadarko worked with an engineering tech-ed class to design, manufacture and install 150 songbird nesting boxes. The project gave valuable real-world experience to students and provided homes to hundreds of songbirds. In Montana, ExxonMobil’s Billings refinery partners with students from Rocky Mountain College to study wildlife near the facility, which borders the Yellowstone River. The site includes ideal learning space: grasslands, deciduous forests, wetlands, open-water lakes and marsh habitats. Students enrolled in Rocky Mountain College classes, such as wildlife conservation, field survey techniques, botany and wetland ecology, are able to conduct research projects on ExxonMobil’s site. One recent project discovered that a pond on refinery property had more biodiversity than others in the area because, in part, it wasn’t fished. 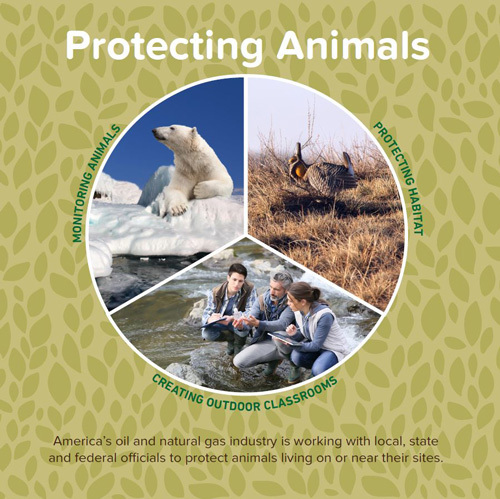 By working with environmental organizations and local and federal officials, the oil and natural gas industry is preserving habitats and protecting wildlife all over the United States. Through monitoring populations, building protected habitats and studying their behaviors, the industry is helping to ensure thriving populations into the future.